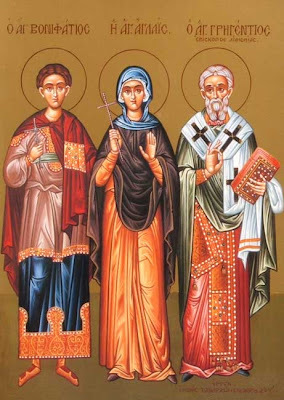 Today (December 19th) we celebrate two great Saints and examples of our Faith: Sts. Boniface and Aglais. Below is the account of their lives from: http://ocafs.oca.org/FeastSaintsViewer.asp?FSID=103583. "The Holy Martyr Boniface was the slave of a rich young Roman woman named Aglaida and he dwelt with her in an iniquitous cohabitation. But they both felt the sting of conscience and they wanted somehow to be cleansed of their sin. And the Lord granted them the possibility to wash away their sin with their blood and to finish their life in repentance. Aglaida learned that whoever keeps relics of the holy martyrs in the home and venerates them receives great help in gaining salvation. Under their influence, sin is diminished and virtue prevails. 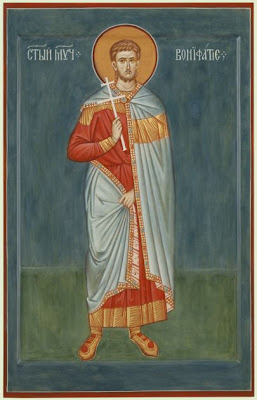 She arranged for Boniface to go to the East, where there was a fierce persecution against Christians, and she asked him to bring back the relics of some martyr, who would become a guide and protector for them. As he was leaving, Boniface laughed and asked, "My lady, if I do not find any relics, and if I myself suffer for Christ, will you accept my body with reverence?" Aglaida scolded him, saying that he was setting off on a sacred mission, but he was not taking it seriously. Boniface pondered her words, and during the whole journey he thought that he was unworthy of touching the bodies of the martyrs. Arriving at Tarsus in Cilicia, Boniface left his companions at the inn and proceeded to the city square, where they were torturing Christians. Struck by the beastly horrible torments, and seeing the faces of the holy martyrs radiant with the grace of the Lord, Boniface marveled at their courage. He embraced them and kissed their feet, asking them to pray that he might be found worthy to suffer with them. The judge asked Boniface who he was. He replied, "I am a Christian," and then refused to offer sacrifice to idols. They stripped him and hung him upside down, beating him so hard that the flesh fell from his body, exposing the bone. They stuck needles under his nails, and finally they poured molten tin down his throat, but by the power of the Lord he remained unharmed. The people who witnessed this miracle shouted, "Great is the God of the Christians!" Then they began to throw stones at the judge, and then they headed for the pagan temple, in order to cast down the idols. On the following morning, when things had quieted down somewhat, the judge directed that the holy martyr be thrown into a cauldron of boiling tar, but this also caused the sufferer no harm. An angel come down from Heaven and bedewed him as he stepped into the cauldron. The tar overflowed the cauldron, splattering and burning the torturers themselves. 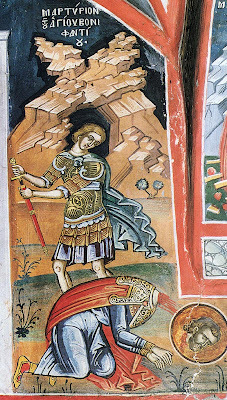 St Boniface was then sentenced to beheading by the sword. Blood and a milky fluid flowed from his wounds. Beholding such a miracle, about 550 men believed in Christ. St Boniface's companions, waiting for two days at the inn for him in vain, began searching for him, thinking that he had gotten drunk somewhere. At first their search was without success, but finally they came across a man who had been an eyewitness to the martyr's death. The man also led them to the place where the decapitated body lay. St Boniface's companions tearfully begged his forgiveness for their unseemly thoughts about him. After they ransomed the martyr's remains, they brought them back to Rome. On the eve of their arrival an angel appeared to Aglaida in her sleep and told her to prepare herself to receive her former slave, now the brother and fellow-servant of the angels. Aglaida summoned the clergy, and she received the holy relics with great reverence. Then she built a church on the site of his grave and dedicated it to the holy martyr. There she enshrined his relics, glorified by numerous miracles. 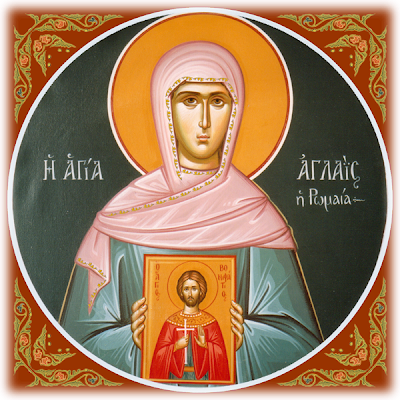 After distributing all her wealth to the poor, she withdrew to a monastery, where she spent fifteen years in repentance, then fell asleep in the Lord. She was buried beside St Boniface. The sins of the one were washed away by his blood, the other was purified by her tears and asceticism. Both were found worthy to appear unsullied before our Lord Jesus Christ, Who desires not the death of a sinner, but that he should turn from his wickedness and live (Ezek. 33:11). 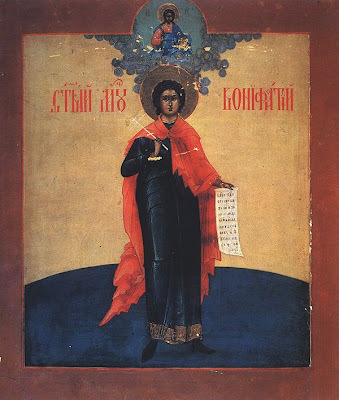 Thy Martyr, O Lord, in his courageous contest for Thee received the prize of the crowns of incorruption and life from Thee, our immortal God. For since he possessed Thy strength, he cast down the tyrants and wholly destroyed the demons' strengthless presumption. O Christ God, by his prayers, save our souls, since Thou art merciful. Thou didst offer up thyself of thine own choosing as a spotless sacrifice to Him that for thy sake, O Saint, shall soon be born of a Virgin Maid, O all-renowned and wise crown-bearer Boniface. The boast of martyrs, you followed fervently, you confessed Christ before the unfaithful valiantly, O wise Boniface, therefore as an inexhaustible treasure, O Martyr, you gave your body to the righteous Aglais, from which the world is watered with deliverance and mercy. Sts. Boniface and Aglais, intercede for us!